Greetings from Transylvania to all juggers! 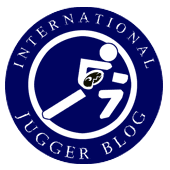 This intends to be a very late report on the beginnings of Jugger in Romania. Here is how it all happened. Once upon a time a lonely fighter of these lands had an adventurous journey full of threats through the unknown. Finally he arrived to the land of the fierce Germans. He learned from them a unique and magnificent art of fighting which they called Jugger. He was so impressed that - as soon as he arrived home - he gathered the most trusted ones from his order and shared his experience with them. All of them being brave - and intelligent of course - took his words seriously and agreed that starting to practice Jugger is the only right course of action. So they did. I could write of course that in 2012 a young fellow from my town (Tirgu Mures, in German: Neumarkt) attended a youth camp in Marienberg and behold, they played Jugger in there. Arriving home, he and his friends started playing. At first they used PVC pipes with a single layer of insulation and no proper padding at the ends. About a year later, however, after discovering the English translation of Uhu’s book, proper pompfe were crafted, with considerable advice of a couple of guys through the international jugger forum. As time passed, new players joined, boys and girls alike, most of them being between 14 and 20 years old (although now we have 20+ members, including myself, ancient 44-year old father of four team-members...). We are playing according to German/Berlin rules, with very few differences. We also make our pompfe according to their way. We call ourselves „Second Cubs” and our coat of arms derives from our city’s old coat of arm (armoured hand holding a sword with a bear's head and a crown on it), with slight modifications, including the switching of the role of the human with the bear’s. Until now - as far as we know - we were the only team in the country, so we did not participate in any kind of tournament. (Of course one day we might visit tournaments in Germany...) Interesting enough, we recently met a friend from a city nearby, Cluj (Klausenburg) willing to establish a team. He saw Jugger on the net but had no idea that we are playing it. We just had our first common Jugger-day today. (Photo taken there.) I really hope this marks the beginning of a real growth of Jugger in Romania. ... a LARP variant of Jugger had been invented both in the US and Germany simultaneously? ... today's Sportugger variant has alledgedly been developed in two places in Germany simultaneously, without knowing of each other?